25 – Because It’s Christmas spreads across the city. 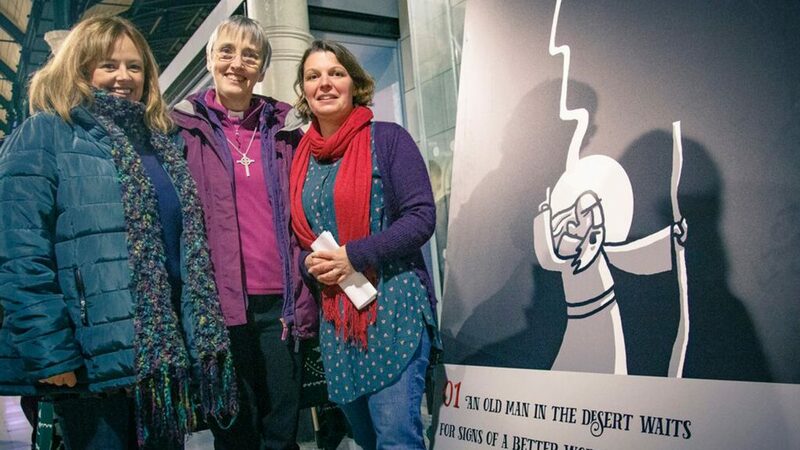 Cathy Westby, and Bishop of Hull – Rt Rev Alison White – and Liane Kensett of Believe in Hull unveil the first cartoon of Hull 25. Hull is benefiting from a large-scale advent calendar of the Christmas story as the city’s church cultural partnership, Believe in Hull, celebrates the month of December. The “25…Because It’s Christmas” campaign consists of a series of simple, black and white prints made by Yorkshire-based illustrator Simon Smith, inspired by the Christmas story. They are accompanied by words from poet Ian Adams. The first building to launch the advent calendar on Saturday was Hull’s Paragon Station and the image on day two was at East Park Café. High-profile public spaces in the city centre and locations across Hull will be the focal points of the Hull 25 advent calendar. The large images will appear in windows or will be prominent at community venues, churches and commercial properties. The location of the daily image will be announced at 8am daily on a dedicated Facebook page @hull25, Twitter @25_hull and website, www.hull25.uk, with a competition for the first person to find it, collect a prize and send in a selfie. A map of all the locations will be available online from www.hull25.uk from 27th-31st December and all images can then be viewed at Paragon Station in the run-up to Epiphany (12th Night) on 6th January 2019. Be the first to comment on "25 – Because It’s Christmas spreads across the city."